Funded by the IDC and part-owned by the deaf community, the newly opened Park Inn Newlands in Cape Town has raised the bar for responsible tourism and innovative development financing. Built with funding from the IDC, and part-owned and operated by the deaf community, the newly opened Park Inn Newlands in Cape Town has raised the bar internationally for responsible tourism and innovative development financing. Something unique has been created in Cape Town – a world leader and a “shining example of what is possible” with vision and energy, in the words of Tourism Minister Derek Hanekom. The 122-bed Park Inn Newlands was opened at a spectacular event on Thursday, 4 December, a day after the UN’s International Day of Persons with Disabilities. And as the evening’s MC, comedian Siv Ngesi, pointed out, it is indeed a special place. Two years ago, the site was home to Bastion of the Deaf, a landmark for the deaf community in South Africa and the Cape Town headquarters of DeafSA. It was also, however, in a state of disrepair, representing an under-used piece of land in a sought-after area of the Mother City. Near Claremont station, it is close to Newlands Rugby Stadium and Sahara Park Cricket Grounds, and boasts terrific views of Table Mountain. This has achieved: fully one-third of the hotel’s staff members are deaf, and there are full-time sign language interpreters on hand for guests. At the same time, the three-star hotel has been designed and built to cater for the needs of all disabled people, including those who are hearing impaired, blind or in wheelchairs. It is a landmark project specially designed to meet the travel requirements of the disabled community – and it has been realised on the back of major funding from the Industrial Development Corporation (IDC). “This is a unique and very special project for us,” said IDC divisional executive Katinka Schumann. DeafSA had one asset – the property – and needed to leverage this as much as they could. “They managed to do this with the assistance of the IDC through its Equity Fund. DeafSA is a 40% shareholder in this business, which means it [will be able to rely less on] grant funding. It will also improve job opportunities in the deaf community. DeafSA holds 40% equity in Park Inn Newlands, with the IDC and Meridian each holding 30%. The hotel is operated by Rezidor, the international company that also operates the Radisson chain. It welcomed its first guests on 13 October and has a staff complement of 92 – of whom 28 are deaf, as is the non-executive director on the hotel’s board. It has been trading for a little over six weeks, and all the projections have already been exceeded. 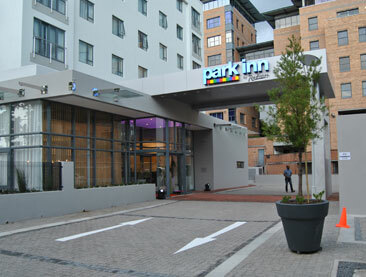 Park Inn Newlands general manager Clinton Thom described the hotel as “next gen Park Inn”. Park Inns, under the Radisson brand, are mid-market and competitively priced. There are 130 of them around the world, and to attract business and leisure travellers, the essentials on offer include very fast free wifi and business centres. “This is an amazing building and we are very proud of having it in our portfolio,” said Friedrich Schaefer, Rezidor regional director for sub-Saharan Africa. Addressing the guests at the opening, Minister Hanekom said there were over a million people in South Africa who were extremely hard of hearing or deaf, and while their condition could be described as a disability, the challenges it posed ought really to be limited. Park Inn Newlands raised the bar, Hanekom said, showing the world that South Africans were leaders. “There is no hotel like this anywhere else in the world. This is an inspiration to people across the country; it tells us what can be done … We talk about community participation and empowerment; this hotel challenges every other hotel to do the same. He said he was delighted that the IDC was getting involved in tourism “and recognising that tourism has enormous growth and employment potential … The challenge for South Africa is to get back on a growth path with as many jobs as possible. It is very important that we do that.